Right now at Woot.com these Contixo KB200 Kids Bluetooth Wireless Headphones are just $28.99 (Reg. $59.99)! 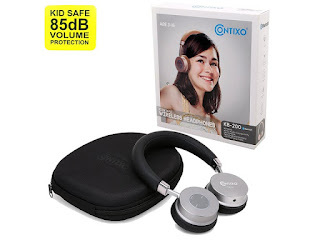 Audio Quality: The Contixo KB-200 has Bluetooth Newest 4.2 Version Transmission Up to 30ft, Ear Protection Technology with Volume Limiter (85db Max to 3db Min) Protects Kids Hearing From Loud Audio Helps Prevent Ear Damage. Audio Drivers: KB-200 Bluetooth Headphones Use a Strong 40mm Dynamic Drivers. We Use the Biggest Size Driver that Fits in the Aluminum Casing, which Results in a True Quality Listening Experience. Charge & Go: For the Best Entertainment Experience We Use a Long Lasting Battery which can Play Music Up to 20 Hours. Kids Head Phones Casing: We Construct Our Casing Very Lightweight to Not Wear Heavy on Kids Heads & Necks. The Contixo KB-200 Kids Headphones Casing is High-Grade Aluminum with a Flat Matte Semi-Gloss Paint Finish. The Over-The-Ear Cup Has a Comfortable 1/2 inch Padding. Offer valid until 9/1 or while supplies last. Shipping is FREE for Amazon Prime Members or only $5 flat rate.